InventoryControl's Windows Mobile/CE app can print labels to a Bluetooth ZPL-compatible label printer when performing an Add or Receive operation. This article discusses the steps needed to set this up. 1. Bluetooth pair the printer to the mobile device. 2. Optional: Edit the label layout ZPL code. 3. On the mobile device, quit InventoryControl if it's running. Connect the device to a client PC. 4. In the PC's InventoryControl, set up the device again, specifying mobile label printing settings. Now on the device, when performing an Add or Receive operation, you can specify the number of labels to print. After tapping OK, the printer should print the label(s). Note: If you get a message on the mobile device that says "The write timed out", this is due to a momentary communication problem between the mobile computer and the Bluetooth printer. Simply tap OK on the message, then OK again on the Add or Receive screen to resend the print job. 1. 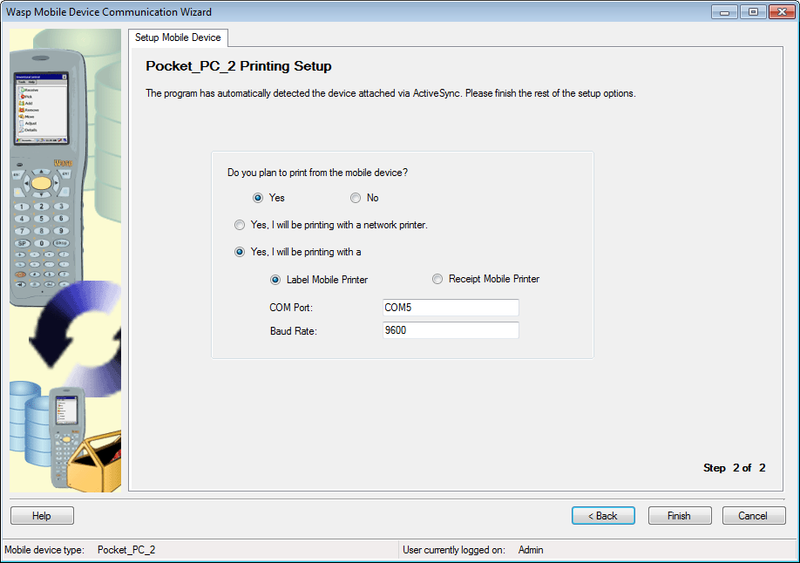 This is how to Bluetooth pair the printer to an HC1 device. Other devices may have a different procedure. a. Main screen, tap Bluetooth. Wireless Manager opens. b. Tap the word Bluetooth. The status changes to On. c. Tap the Menu button at the bottom, Bluetooth Settings. d. The default tab is Devices. Tap "Add new device...". Available Bluetooth devices appear in the list. e. Tap your desired printer/device, then the Next button. f. Enter the device's connection passcode, then tap Next. The device appears in the list. g. Tap the device. Partnership Settings appears. h. Check the box for Serial Port, then Save. i. At the top, tap COM Ports, then New Outgoing Port. j. If needed, tap the device to select it, then Next. k. Change from COM0 to some other port (suggestion: COM5) and tap Finish. l. If you get a message that "The COM port could not be created. Please check your settings and try again", tap OK, then select a different port, Then Finish again. m. When this is successful, you'll see an entry with your device name and the COM port in the list. Note the port number for later use. 2. This step is optional. If you don't customize the label, the default layout shows the item description, item number barcode, and item number. i_ItemNumber.txt: The ZPL code that is sent by default. i_ItemNumber all fields.txt: ZPL with references to all available label fields. i_ItemNumber - code with notes.txt: Contains notes about the file and ZPL commands used. Then use a text editor such as Notepad to edit the "i_ItemNumber.txt" file's ZPL code as desired. The ZPL Programming Guide (which contains some exercises) is linked below in Related Pages. Note that Wasp Tech Support doesn't offer any other programming lessons or debugging service. 3. On the mobile device, quit InventoryControl if it's running. Using a data cable, connect the device to a client PC, the same as when initially setting it up or for batch mode communication. 4. In the PC's InventoryControl, Mobility section, either Windows Mobile / CE (Batch) or (Wireless) option, Setup Mobile Device again. Baud Rate: Match the setting from your device. 9600 should be safe if you don't know. Other valid values are: 14400, 19200, 38400, 57600, 115200.